It was time for my monthly march to West Bottoms. I have posted about it before but it's an area in town that has converted old brick buildings into a antique and flea market heaven. They open the first Friday of each month and are open for the weekend. Some vendors are open other times during the month, but the party is the first weekend. 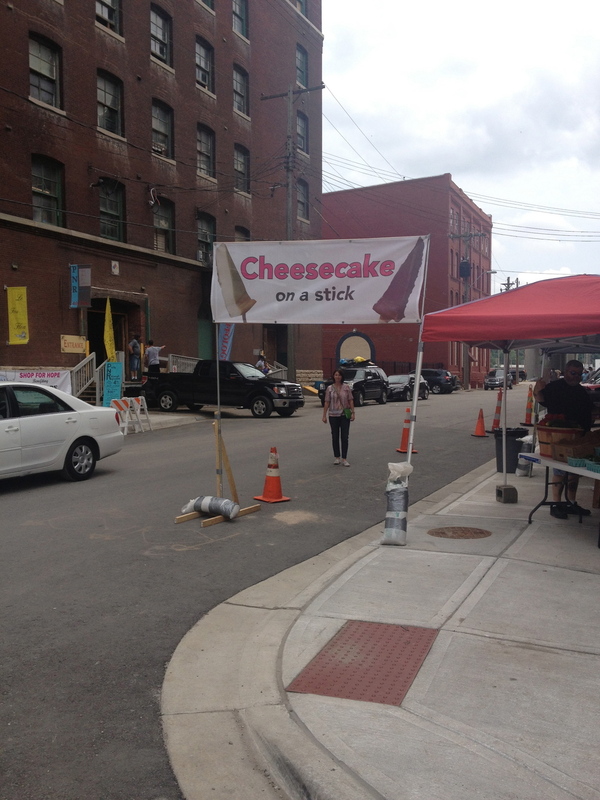 There's shopping, music piped through the streets and cheesecake on a stick! How can you go wrong? Ok I'll be honest, I haven't tried the cheesecake, but the gyro from the street truck was fantastic. Its also hard to have perfect weather. These buildings lack the modern convinenence of an air conditioner, so if you're a sweater bring your sweat towel to wipe your brow as you march on. It also tends to be packed on Friday which I love. It makes the hunt feel all that more important for the perfect piece. Vince who is my loyal ride along if I'm not going with clients, prefers the quiet atmosphere found on Sunday. Either way it's worth a stop. I expect I'll blog about this one most months.